November 10, 2014 0 comments on "Dabur Chyawanprash- Weapon Against Infections"
It is rightly said that Health is Wealth, and when it’s the matter of our children’s health, than without any second thought it’s the most precious wealth which we need to take care of. With this ideology, India’s very own Dabur has gifted us the old weapon to protect our child from various diseases and infections around us. The product is very well known to us as Dabur Chyawanprash. As we all know that precaution is better than cure, Chyawanprash creates a shield around our child which protects them from various infections and thus in turn saves them from falling prey to various diseases. With autumn days arriving in the city, the chances of our child getting infected is very high, hence we need to provide them with some extra security which will prove useful for them to fight against those diseases. 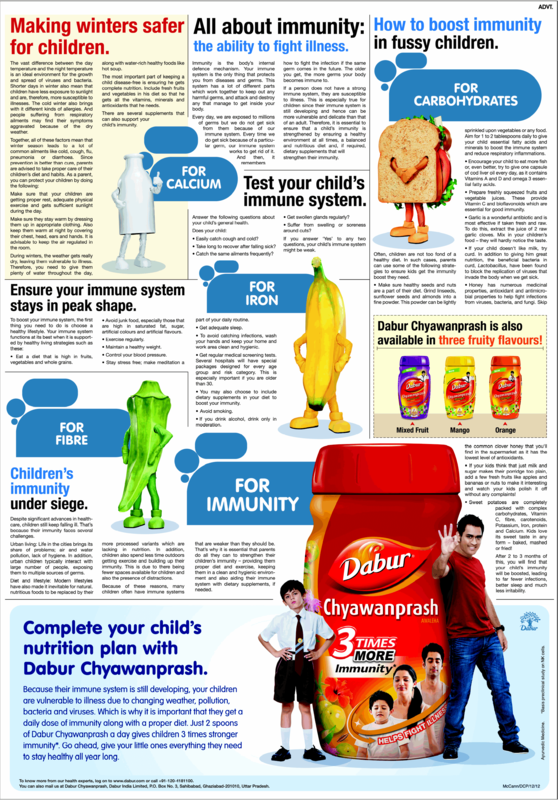 Dabur Chyawanprash which is made up of herbs like Giloy and Amla which boosts the immunity power in our children. About 100 g of this product contains 15,000 mg of Amla. It also consists of forty other natural ingredients which act as a strong antioxidant that helps in strengthening the body’s natural defense mechanism by stimulating Natural Killer Cells. It also contains other powerful herbs, which are known for their health benefits. The list includes Ashwagandha, Vidarikand or Pueraria, Pippali or long pepper, Jatamansi, Neem and many others. It is a general health tonic and is the best known Ayurvedic tonic. With its natural sweet taste, children find it inevitable to stay away from it. Hence our child will take a step forward for his better health against the cumbersome process of parents trying to give children the prescribed medicines. Chyawanprash is usually consumed directly or along with warm milk or water. The recommended consumption is usually about 1 tbsp a day. Chyawanprash is a safe herbal tonic with no side effects and people of all ages can take it for promoting health and well-being. Also, we need to take care of various other things which are as much essential in keeping diseases at bay from our children. One of the most important things among them is cleanliness. As it is said that cleanliness is next to godliness, we should ensure that our child washes his hands every time when he comes homes after playing. We should also ensure he washes his hands properly before having his meals/snacks. Fruits and vegetables should be properly washed before consuming it. Together, with all this things, we can assure ourselves that we have laid a strong foundation to keep our children secure and healthy.